Disney World's Fantasyland Expansion is complete and the last attraction is open to the public. 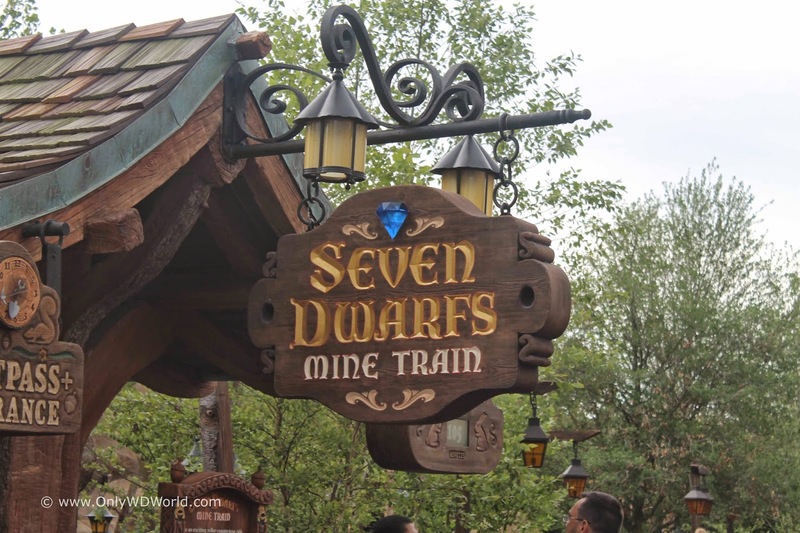 Only WDWorld had the opportunity to ride the Seven Dwarfs Mine Train during its opening days and we will share our impressions of Disney's newest Roller Coaster. 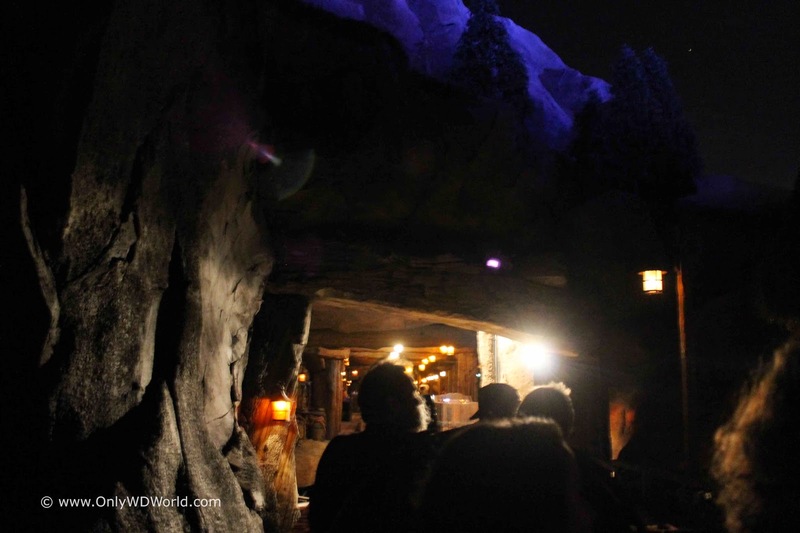 After collecting feedback from many different people who have ridden the Seven Dwarfs Mine Train and combining that with our personal first hand observations, we will have to say that this is a fun attraction that you will definitely want to experience for yourself. 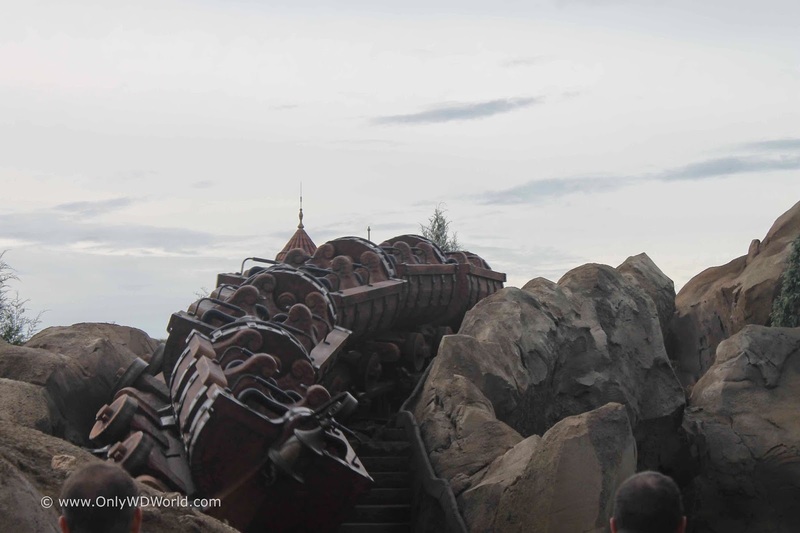 The overall ride experience falls between Big Thunder Mountain Railroad and the Barnstormer starring the Great Goofini Roller Coaster. Seven Dwarfs Mine Train (aka 7DMT) has great theming from the Disney animated classic Snow White and has tied it in well to the attraction. If you utilize Disney's FastPass+ system the line moves very quickly, otherwise you will probably be in for a 100+ minute wait. 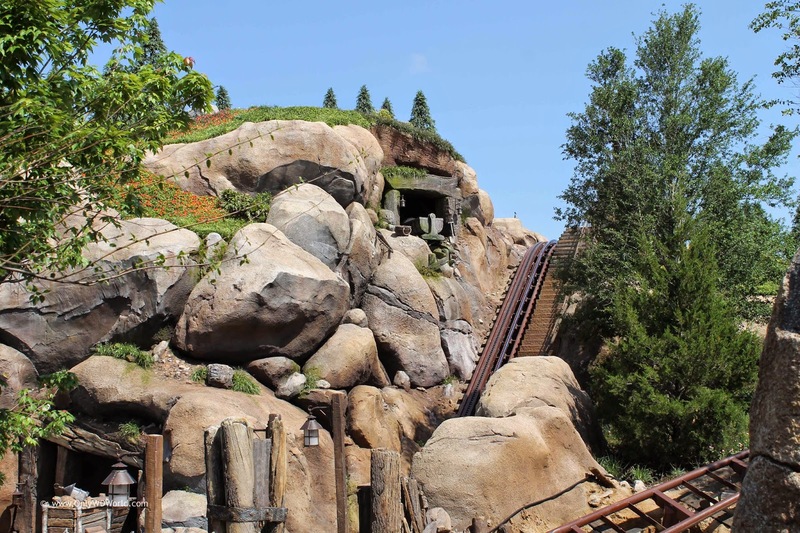 The attraction is built to look like a mountain with a mine built into the side of it. The landscaping and stonework is well done and makes the attraction look like it has been there for years. It seamlessly fits within its surroundings of new Fantasyland. 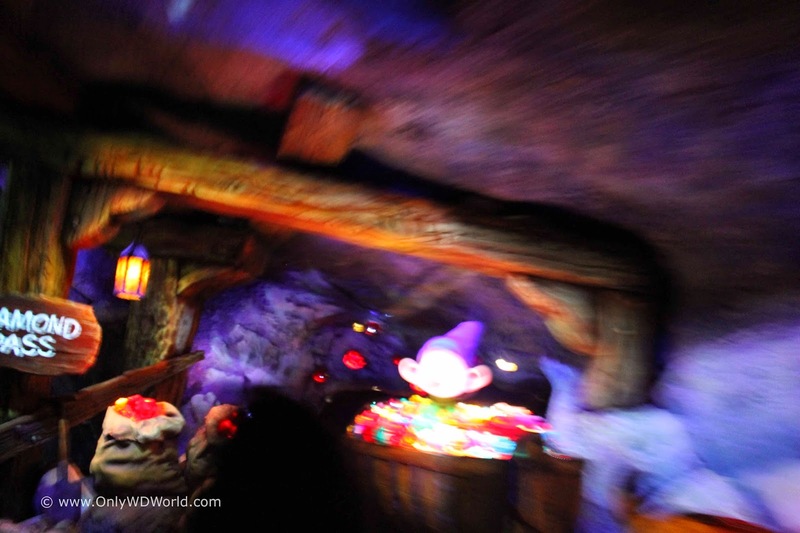 Inside the entrance to the ride you find yourself in the mine. 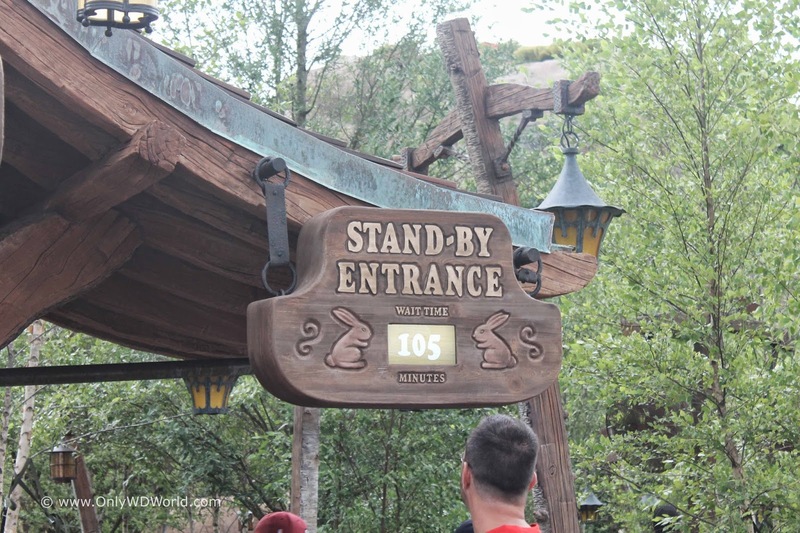 The FastPass+ line is short and quickly transports you to the boarding area, while the Stand-By Entrance takes through a number of interactive mining and Disney Dwarf related elements. These won't shorten the wait, but they will help you pass the time. 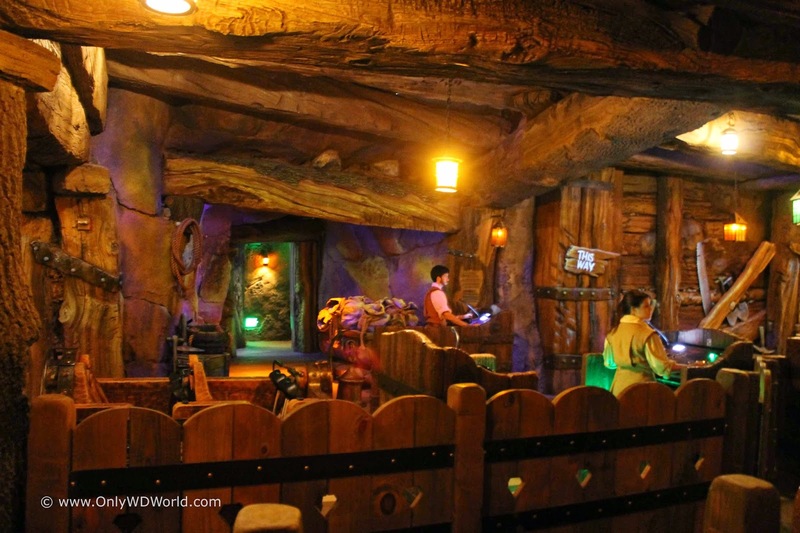 The mine car styled train that serves as your ride vehicle utilizes patented Disney technology that allows the car to rock back and forth. Unfortunately we did not really notice much of this effect while we are riding. The ride itself is the smoothest running roller coaster at Disney World by far. This made for a tremendous experience that even non-roller coaster fans will enjoy. Soon after your journey begins you leave the mine and head outside. Multiple times during the attraction, you are outside and then return inside. 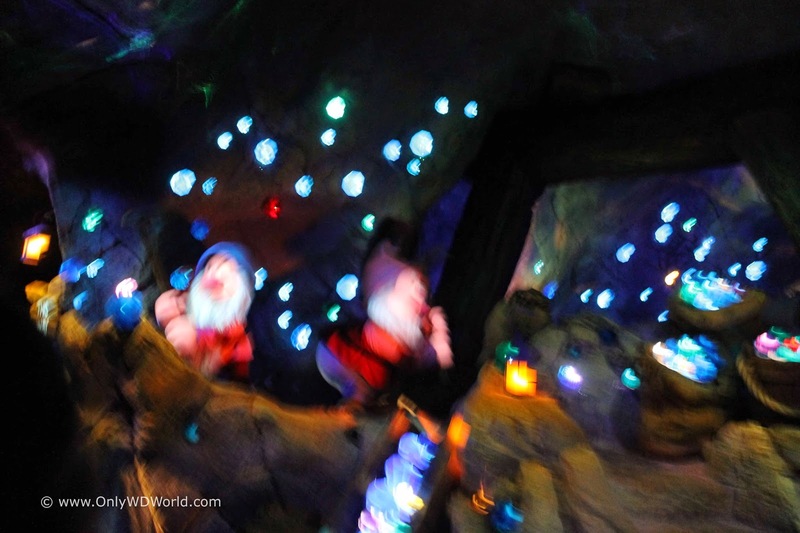 During one extended inside portion of the attraction, the mine cars slow down purposefully so that you can see the animatronic Dwarfs and the stunning visuals inside the mines. Our night time pictures are admittedly awful, but you will have to imagine for yourself what this looks like. Prepare to be impressed! Perhaps most impressive when riding at night are the views of new Fantasyland and Cinderella Castle that you get during the outside portions of the ride. You get great views of Beast's Castle and a bird's eye view of a large part of Fantasyland. 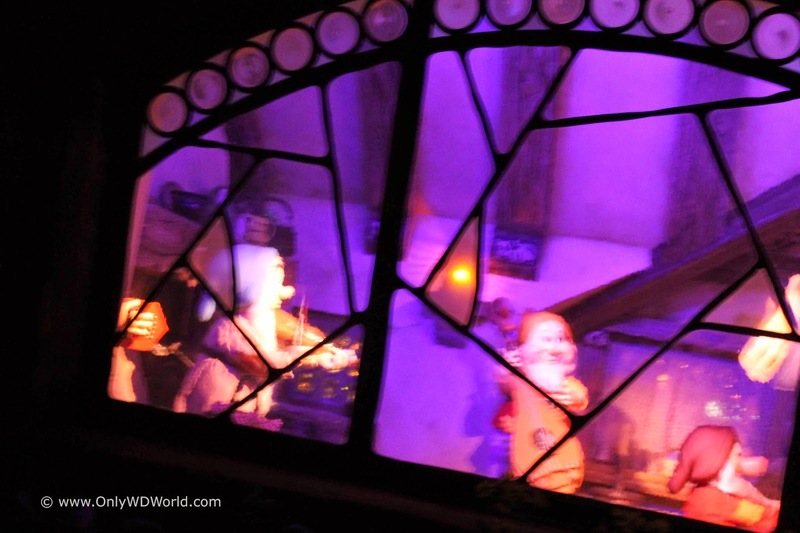 At the end of the ride you are witness to the famous scene where Snow White and the Dwarfs are dancing in their house, including Dopey standing on his fellow dwarf's shoulders to be dancing eye to eye with Snow White. Ride Review Summary - E Ticket Attraction! 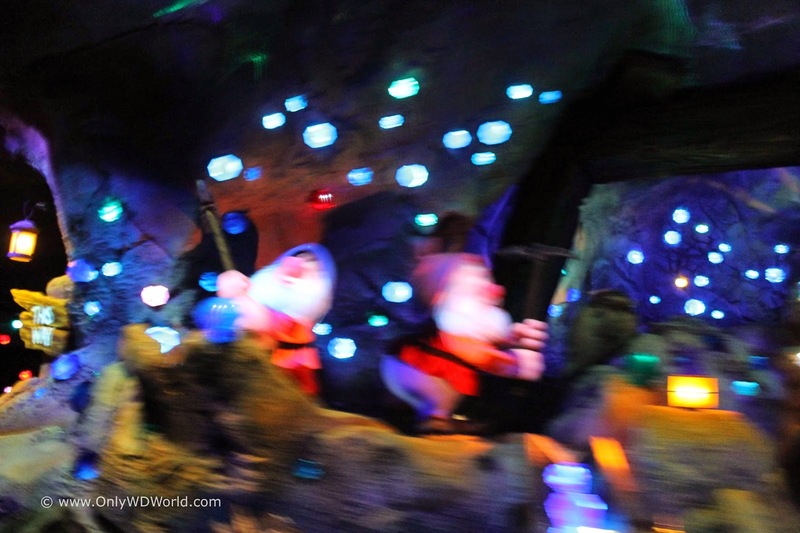 The Seven Dwarfs Mine Train is an attraction that fits perfectly into Fantasyland at the Magic Kingdom. It is more thrilling than most of the rides at the Magic Kingdom, but will still appeal to the younger guests that frequent Fantasyland. It will most definitely help provide that sought after counter balance for the boys that want something other than Princess attractions. The adults will love the theming and enjoy the smooth action of the Roller Coaster. They will also enjoy the great animatronic characters that they will encounter during the attraction. This will not be the new thrill seeker destination when they enter the Magic Kingdom. 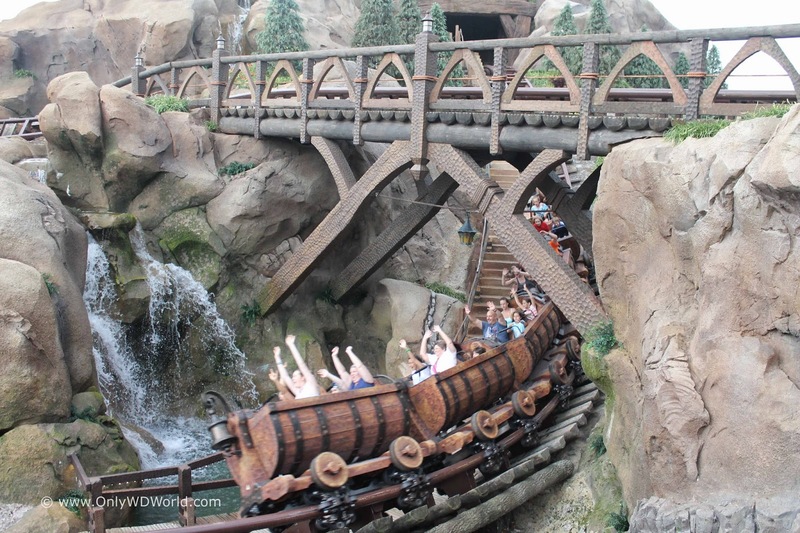 The triple mountains of the Magic Kingdom - Space Mountain, Big Thunder Mountain Railroad, and Splash Mountain retain their thrill seeking titles. That being said it is still a quite enjoyable ride that has the aura about it that will cause guests to want to ride it over and over again. 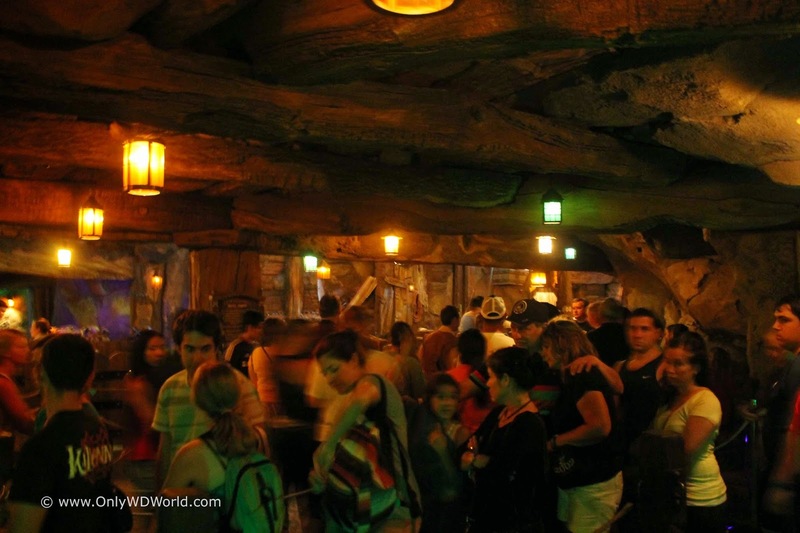 The Seven Dwarfs Mine Train is definitely deserving of an E Ticket rating! 0 comments to "Review Of Seven Dwarfs Mine Train At Magic Kingdom"